He is considered by many in the business to be one of the Best Dean Martin Lookalike Tribute Artist working today. With his amusing dialogue and charismatic demeanor, His on-stage performance as Dean Martin is one to be remembered. 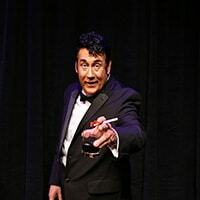 He brings Dean Martin’s brand of humor and showmanship to every show and his relaxed style of singing, entertaining and humor captivates and leaves audiences spellbound and wanting more. Having come from a musical family, he has been a performer pretty much his entire life, as a child it was singing, dancing and impersonating comics. 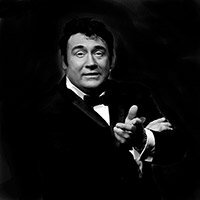 Dean’s singing, variety show, appearances on Johnny Carson, Man of The Hour or Dean’s numerous movies became one of the biggest influences on his style of entertaining. 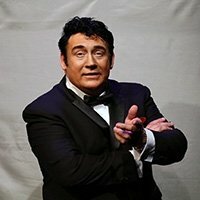 He was classically trained as a vocalist but mainly developed his love of the crooner style of singing and has been performing in bands, stage performances and solo for over 30 years and has won numerous awards for various vocal and stage performances. He was also a stand up comic and musical actor but longed for those crooning roots. It was natural for him to mix his love of crooning, acting, stand up comedy and showmanship to Impersonate the master of them all, Dean Martin. 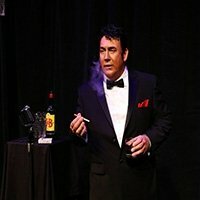 This show recreates his appearances in Vegas from the 1960’s. Including the music AND the stand up comedy that made Dean a household name. Full Tux and Bar!! Dean was a huge fan of western movies and country and western music so it’s only fitting that he also does a country show (full western costume) as Dean singing hits from his 15 Gold country albums including Dean styled country humor. This is a one hour show. Probably one of the things Dean was most loved for were the roasts. He is am available as an Emcee or Roast Master for events with tailored jokes for events and “roastees”. 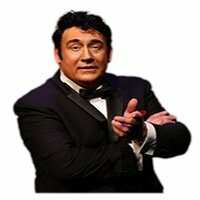 Imagine bringing Dean Martin to an event as the evenings host complete with humorous one liners and jokes.